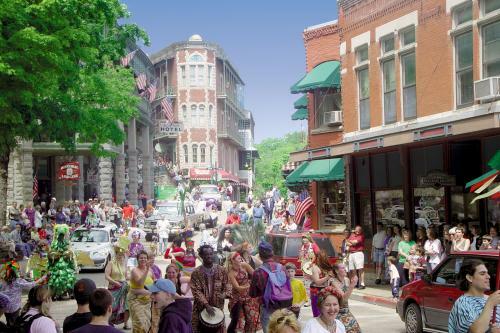 Did you know the city of Eureka Springs was founded on July 4th? All the way back in 1879. Come on over and help us celebrate our birthday and the country’s birthday! Starting on July 1st , The Eureka Springs Historical Museum presents the Happy Birthday Eureka Springs Stroll. This fun-filled historical event will take place on Saturday, July 1st and Sunday July 2nd, from 5:00pm to 8:00pm. Tours will leave the parking lot every 30 minutes, with tours lasting one hour. This tour focuses on the “upper loop” of Eureka Springs. A historical character will be featured outside each home or landmark giving a brief summary of the significance of the structure pertaining to the history of Eureka Springs, and the people who resided or worked there. Click here for more information and to buy tickets. 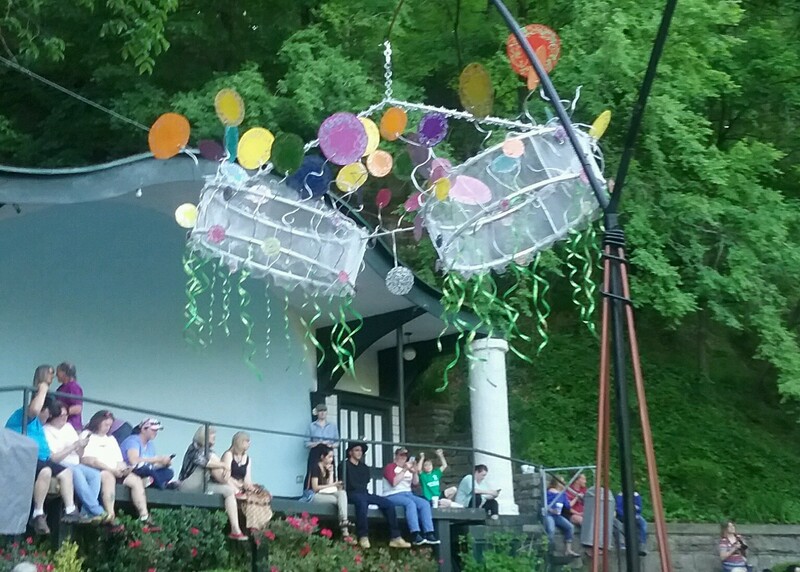 Also on the 2nd, the Eureka Springs parks department decided to bring fireworks back after an eleven year absence. Rumor has it, that this was done to help celebrate the new owners of The Woods Cabins! Well, that’s the rumor between Debbie and I. Actually, I think the new parks director may have had something to do with it. The fireworks will be out at Lake Leatherwood Park on Sunday, July 2nd. You can spend the day swimming, hiking, boating (boats, kayaks and canoes for rent) or just relaxing in the Park. Concessions will be available beginning @ 5:00PM. FREE in town parking at Planer Hill Transit station. Shuttles (also no charge) will be running from 5:00PM-11:00PM to and from the Lake make your day even more relaxing and convenient. Parking @ Lake Leatherwood is $5.00 per vehicle. Special parking will be available for church vans & buses. 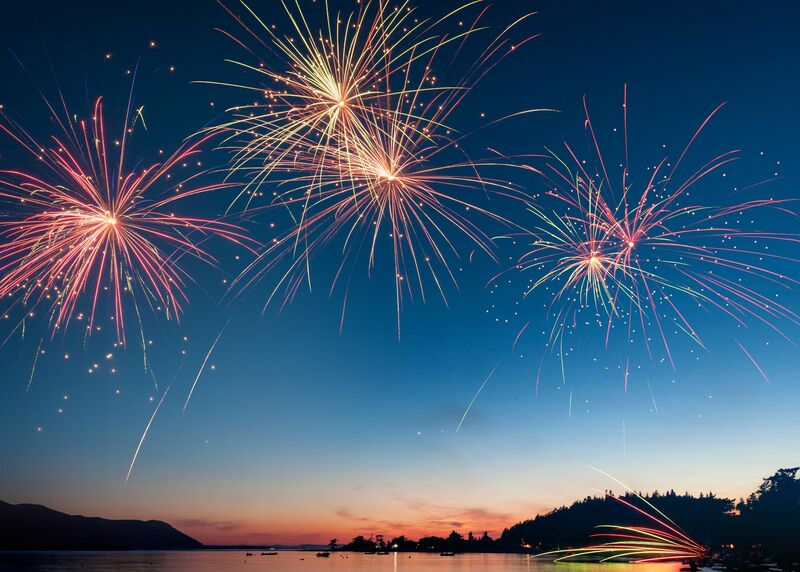 The fireworks extravaganza will begin @ 9:30PM. On the 4th, there will be a parade downtown! Eurekians don’t miss a chance for a parade. 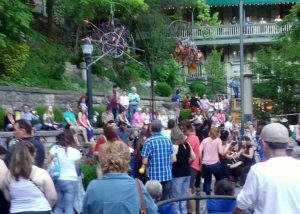 Being a local in Eureka Springs is kind of a funny thing. We live in the most beautiful, unique town in Arkansas! We go about our daily lives, going to work, taking the kids to school, going to the grocery store, you know, the mundane day to day things we all do. But from time to time we have to remind ourselves where we are and that people come from all over the world to see our town! There is so much going on here every day! For example, just recently my daughter came to visit with her family and we all walked downtown to Drumming in the Park! Everybody is welcome to participate! Just bring a drum, or really anything that makes noise, and join in! We have done this before and had such a great time! The town fills up with all the locals and the atmosphere is so amazing. Everybody is dancing to the sound of the drums and everybody is smiling and dancing together! 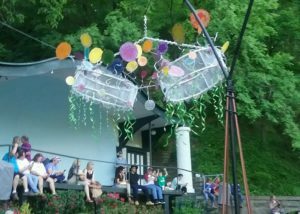 The Festival of the Arts kicked off on May !st and there were mobiles hanging over Basin Park that were created by some very talented artists! They just added another element to the whole atmosphere down there! My kids and grandkids were so cute! They just got in there and danced with everybody else! It truly is so much fun! We have kind of made it a family event once a month to go down to Basin Park and dance! Thanks Lora! 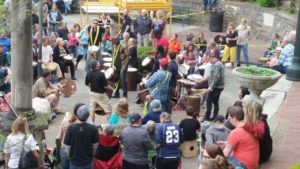 Drumming in the Park is every first Saturday of the month from April through October, starting at 6:00PM until 8:00PM in Basin Spring Park.